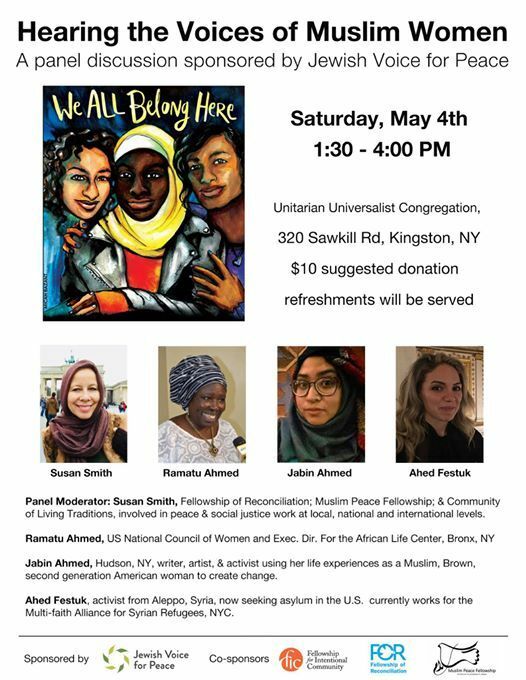 “We All Belong Here: Hearing the Voices of Muslim Women,” is a panel discussion of four Muslim women who live in our region. Panelists will share individual hardships and experiences with Islamophobia, while the panel as a whole will examine the intersectionality of diversity and oppression; how perceptions are formed and how governmental policies have tended to reinforce negative stereotypes of “others". In an effort to learn about our Muslim neighbours and confront Islamophobic rhetoric, the panel will endeavor to connect challenges faced by the local Muslim community with historical events and other social justice struggles existing on the national and international level. 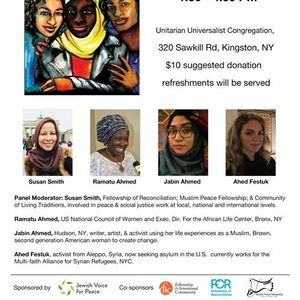 As Ramadan approaches, this is an unprecedented opportunity to learn about and better understand Muslim experiences through a female lens both in the Hudson Valley specifically, and the US in general. $10 suggested donation, no one will be turned away.